Unique and a winner any night of the week! This Sour Cream and Bacon Crock Pot Chicken is full of flavor! Great by itself or over rice! The whole family always loves it when I make this one! *Note* If you need it to be gluten free there are some tips on the recipe. Place the bacon in a large skillet and cook over medium-low heat until some of the fat is rendered. Be sure that the bacon is still pliable and not crisp. Drain on paper towels. If you use this method, reduce the flour to 1/4 cup. Or don't cook the bacon and proceed with the recipe. Then wrap one slice of bacon around each boneless chicken breast and place in a 4-5 quart crockpot. In medium bowl, combine condensed soups, sour cream, and flour and mix with wire whisk to blend. Pour over chicken. Cover crockpot and cook on low for 6-8 hours until chicken and bacon are thoroughly cooked. You may want to remove the chicken and beat the sauce with a wire whisk so it is very well blended. If you have a newer crockpot, check the chicken at 5 hours. The internal temp should be 160 -170 degrees F.
Serve over rice, couscous, or wide egg noodles. **Gluten Free** Check labels. You can buy gluten free Cream of mushroom soup although many brands are not. My mouth is watering…it looks delicious!! I really want to fix this tonight…don’t have 6 hours. 350 for and hour in the oven??? Any suggestions!!! Sounds like it should work. I would just keep an eye on it! I love crock pots, my mom, your site, and the looks of this chicken! Sounds good, but Cream of Mushroom soup is not gluten free. You can actually buy gluten free cream of mushroom. Hey! This looks wonderful! Do you know if the bacon gets crispy at all when cooking in the crockpot? My husband was curious about it! 🙂 I think we will try this one day this week. Thank you! You can brown the bacon a bit first before you place it in the crockpot. This helps it get nice and crispy. I’m allergic to mushrooms any suggestions for a substitute. You can use any cream of soup. Like cream of chicken. This sounds wonderful. However, for those of you with celiac disease, most cream of soups have gluten in them, so be very careful with this recipe if you or your family has problems with gluten! I was wondering, do I need to add the water that is requested on the can of soup? I’m thinking I will need to because with the flour, the sauce will be super think…. Any suggestions from anyone that may have made this already? I have this in the crockpot right now, and it is nice and creamy. When I first put it in it was very thick, but as it cooked it loosened up a lot. No need to add water. I’m making this right now! I’m glad I read through the comments, because I noticed the sour cream/condensed soup mixture was thick. Wasn’t sure if water needed to be added or not. Thanks for the info! Looks great! Can there be a different soup substituted for cream of mushroom? Can you put the chicken in frozen? It’s never recommended to put any frozen meats into your crock. The time it takes the crock to defrost the meat before cooking it allows bacteria to grow. I use frozen meats all the time in my crockpot and there has never been a problem with someone getting sick. I put frozen meat in the crockpot and it’s never been a problem. Got the idea from a friend who does it once a week for years without incident. My mom used to make something like this. We called it “party chicken.” The only thing different is that you roll chipped beef up in the chicken and secure with a toothpick. Sounds kind of weird, but it is phenomenal. Any time you use chipped beef, though, make sure to rinse it first because it is super super salty! A college roommate introduced me to that and you are right that it was yummy! I made this tonight and it was really good. I did add about a 1/4c of chicken broth to the gravy to loosen it up a bit. I didnt cook my bacon very well before wrapping it around the chicken. Next time I am going to cook the bacon as much as it can be and still be pliable, it was pretty fatty without cooking it down. Other than that I loved it & will def make again! I served it with mashed potatoes and broccoli… Turned out great! It’s in the crockpot as we speak. I only had one cream of mushroom and one cream of chicken. I added two garlic cloves (minced) to that. I hope it turns out as good as it looks!!! I made this after finding on Pinterest. Fabulous recipe! My 5 year old raved about it and wants me to make it often. Thanks for sharing such a winner. This looks like a great idea. I have found that chicken and the crockpot are good companions. I will try it soon. Oh good, i went and got the stuff to make this but forgot the sour cream but have greek yogurt here.. was wondering if i could still use it and save the same effect. Thanks. Awseome cant wait to try! Thanks!! I made this yesterday it was AWESOME!!! My hubby doesnt like the mushrooms so i used cream of chicken soup instead, and i chopped up onions in it!! The best part was i didnt have time to cook the bacon so i used a packet of REAL bacon bits in it, WAY easier and YUMM! Also, i mixcd in a packet of ranch seasoning with the sour cream!!!! Just a FEW ideas to put in your mind!! this is a good recipe to play around with!!! THANK YOU!! I am going to try this but I am going to crisp up my bacon and chop it and add right to the soup! Great recipe. Instead of adding flour, I whisk in a pkg. of brown gravy mix into the sour cream mixture after chicken is cooked. I don’t have 5-6 hours. I’m planning to throw in the oven. Any success stories with doing it that way and any tips for putting it in the oven instead? I just made it in the oven- 375 for 45 minutes- I think it was done before that but that is when I checked it again. It was super yummy- I made the cream of chicken soup from scratch to be gluten free. Just put it in the crockpot! This is a GREAT recipe! In my attempt to lower the fat and calories in this recipe, I used 98% fat free cream of mushroom and added a teaspoon of fresh mined garlic and used reduced fat sour cream. I served over brown/wild rice and it was delish! I cooked on high for 5 and half hours and it worked out great! This looks great! I need to use my crockpot more and I have been looking for something new to do with chicken. Going to try this very soon! I made this tonight in the oven. I baked the chicken in the soup mixture for 45 minutes at 350 then added chopped up cooked turkey bacon on top when it was all done! Was a hit with the family! We had it with salad and a funky shaped pasta. I meant to have mine with brown rice, but I forgot! I am going to try this but instead of cooking on low for 6-8 hours, I am going to cook on warm. My crockpot gets so hot, I have ruined the past 4 crockpot recipes I’ve tried by over cooking. Think I could use pork chops instead?? *************cream of mushroom soup HAS GLUTEN in it!!! Yes, but you can buy a gluten free cream of mushroom soup. 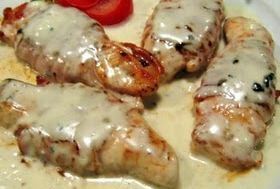 Add Cream of Chicken to Recipe. I want to use this for a OAMC idea. Ideally, I make things up that go in the freezer. With this dish, should I combine everything and put it in the freezer before cooking, or cook it all up and then freeze it? Delicious! I would recommend crisping the bacon first other than that it was awesome. This is amazing! We’ve been eating a lot of chicken lately….this was a great way to switch things up a bit. It is deeeee-lish with egg noodles! I would love to try this recipe but my crock pot is small. Is there an alternative to making this in the oven? I make my own condensed soups for my family. The taste is yummy and it’s gluten free! 1. Saute minced onion in melted butter in a medium saucepan. 2. Whisk in corn starch, flour, salt and pepper until thoroughly combined. 3. Slowly add milk, whisking to prevent lumps. 4. Heat until thickened, stirring constantly. 5. If you want to make this a specific cream soup, add the extra ingredients (1/4 cup of mushrooms, chicken, or celery) with the minced onion and saute in the butter. We made this today in Panama, and it was absolutely delicious! You can’t go wrong with the bacon, but the chicken breasts were cooked perfectly and were very tender and tasty. We added two cloves of garlic, diced, and it was awesomeness! Thanks for the recipe. I found this on Pinterest made it last week also made homeade noodles it was delicious!! Just put it all in the crock pot on high for 6 hours. I wish I had read the comments first, as I as well, though the mixture was too thick and I added half a soup can of water. Hopefully it will be ok! I also added minced garlic as I couldn’t find roasted garlic cream of mushroom soup. This should ready for when we get home tonight! Made this last night and my boyfriend left nothing on his plate. Woke at 9 am this morning to finish off the leftovers! Great recipe! I made this the other night and my family loved it! We had quite a bit left over so I took the leftovers and added a can of cream of potato soup, 3 cans of water, some frozen spinach, onions, shredded carrots, some homemade dumplings!! Yummy! I used one can of the condensed Cheddar Cheese soup and one can of the Cream of Chicken and Herbs and a bit of extra bacon wrapped on the chicken. We love cheese and bacon combinations so gave it a shot that way. Was very good like that. I did use a bit of salt but could have skipped that as it was plenty salty. Will make again soon. I tried this recipe and it turned out so well. Thank you so much. I love cooking with my trusty crock pot. Anyone ever thought of added can diced tomatoes? I was wondering if that would be good? Progresso(sp?) now makes gluten free cream soups. My mom is celiac and we found over thanksgiving. She was finally able to enjoy green bean casserole, again. That is AWESOME! I am so glad to hear that they did that. I will have to look for them when I head to the store. Thanks! I made this recipe for dinner and it was delicious. My sons want it again. It will definitely be added to my recipe collection. My husband said it was the best Chicken breast he has ever tasted. He like thighs because breast meat is to dry. Not this breast it was moist and falling apart. Will be a go to recipe from now on. Really good! I only did half of the meal, but next week I will do the whole thing and bring half to some friends! The only thing I left out was the salt and pepper. I paired it with Yukon gold potatoes and just put the sauce over the potato. My picky toddler gobbled this up when I mixed the two together. Top 10 recipes for sure! Have made this several times. LOVE it. i double the soup/sour cream mixture so we have more sauce to go over the chicken. For all the people saying the cream of mushroom has gluten in it, I know it’s necessary to be careful, but it’s NOT necessary to be rude about it! How sad to see that in the comments. AND, there IS a gluten free option (the only one we can use, have been using for years). Pacific brand. Right on the label is shows that it is gluten free.